Time Frame daily: Exiperes time two daily. 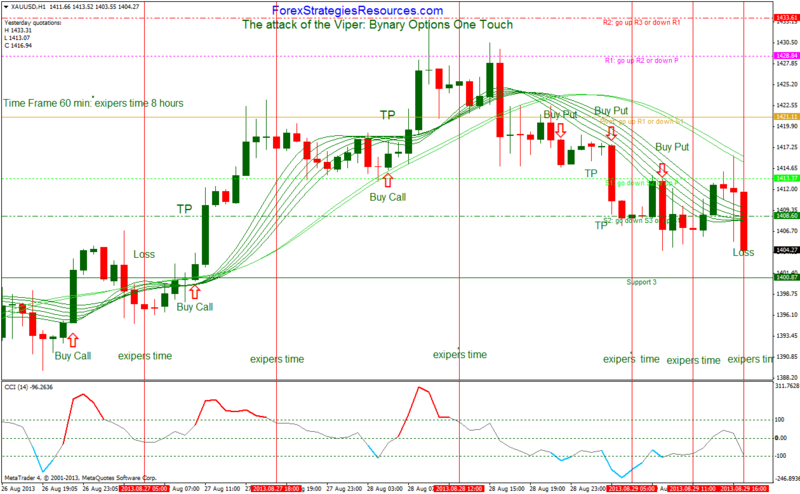 This is a Trading Method with binary options trend following, this is based on a set of T3 indicator and CCIRNP indicator. The rules are the same of the previous trading Method, but, I have added for intraday trading Fibonacci Pivot how touch point and the time for the expires of Binary options One Touch is different. Time Frame 60 minutes: Exiperes time 480 min. In the pictures below The attack of the Viper Binary Options Strategy in action. Binary Options Strategy: The attack of the Viper. The indicators and Template with Fibonacci indicator for The attack of the Viper:One Toch intraday Binary options strastegy.